DO YOU NEED TO REMOVE 2 POINTS FROM YOUR DRIVER LICENSE? ARE YOU INTERESTED IN SAVING MONEY ON YOUR AUTO INSURANCE ? 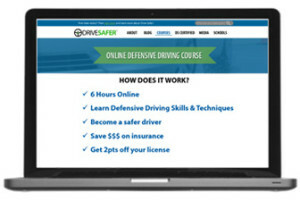 Drive Safer is pleased to provide you with an online defensive driving course to meet your goal of removing points from your driver license and also to help you save money on auto insurance. This course is a NJ State Certified Defensive Driving Program. Once you complete the courses, you will receive a certificate of completion in the mail that you will provide to your insurance agent or insurance company. You information on course completion will also be sent directly to motor vehicles and should show up on your driving record within a few weeks of completion. If you have any questions, please feel free to contact us at (201) 485-7792 or info@drivesafer.com.